The Nine Winners of the Ten Categories! Kelsall WI members opened the doors of the community centre at 9.30am on Saturday 27th September and were delighted with the number of entries to ‘the Bake off with a Bee’. The most popular categories were the cupcakes by children under 11 and a single large cake using a Mary Berry recipe. The hall was cleared for judging soon after 10am, while this was taking place the contestants had a go at the quiz and tasted the home made biscuits. As the clock moved round to11am the tension started to mount and the children became very excited. 1st Sharon Grover, 2nd Evie Clark, Joint 3rd Leon Moorhouse and Isobel Baker. 1st Dorothy Baker, 2nd Mary Bool, 3rd Elizabeth Baskerville . 1st Annabel Nicholas, 2nd Louis Grover, Joint 3rd Lily Moorhouse and Jess Clarke. 1st Joy Bottomley, 2nd Alex Russell Moore, 3rd Karen Boyce. 1st Sharon Grover, 2nd Janet Herdman, 3rd Isaac Grover. 1st Janet Herdman, 2nd Barbara Shellbourne, 3rd Val Templeton. 1st Mary Gaskarth, 2nd Jane Beattie, Joint 3rd Mary Diggle and Jackie Cooke. Craft something new from something old. 1st Dot Berry, 2nd Harry Gaskarth, 3rd Evelyn Cragg Hine. 1st Val Bogle, 2nd Val Bogle, Joint 3rd Tina Harris for her two entries. Best in show was a knitted scarecrow which won the Toy category. Everyone enjoyed viewing the entries and eating Wally’s Hot Dogs. 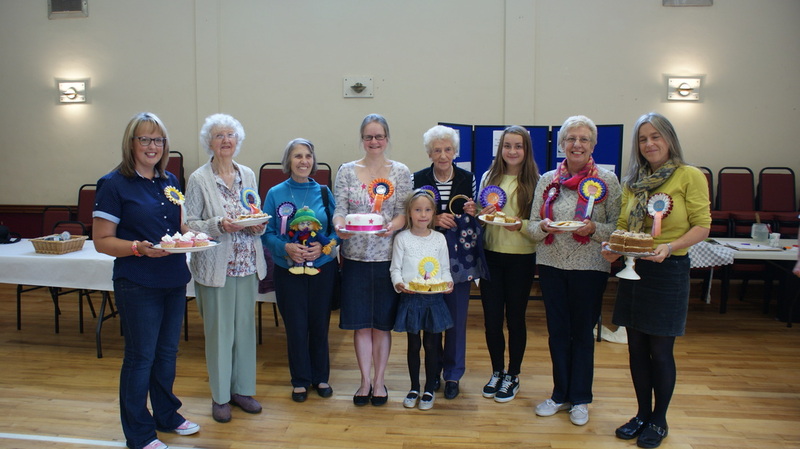 Children’s activities were available and visitors had an opportunity to look at the WI display and a Show stopper cake made by Helen Donaldson who is a professional cake maker. Many local businesses and individuals donated prizes for the charity raffle. This was in aid of Tarporley Memorial Hospital which is Kelsall WI’s nominated charity for 2014. The raffle raised a grand total of £305.